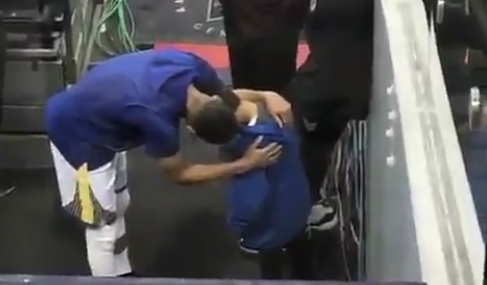 In yet another example of sports being about something so much greater than competition, NBA star Stephen Curry took a moment before Monday night’s face off between his Golden State Warriors and the Dallas Mavericks to console a grieving youngster. The emotional moment was captured on video by attendees and posted to social media and seemingly shows Curry praying and sharing a word with the clearly emotional boy. Last Thursday, Bruce Harris, the brother of Mavericks guard Devin Harris, died in a car accident. Though Harris did not play in Monday’s game, his nine-year-old nephew Brayden, still coming to terms with his father’s passing, was at American Airlines Center in Dallas. The young man reportedly got to hang out in the Mavericks locker room, before meeting with Curry, who also autographed some memorabilia. After the game, Curry told reporters that there really aren’t words to describe what Brayden and his family are going through, but he did his best to ensure the little boy knew he was not alone. Harris, meanwhile, addressed his brother’s tragic death, saying it has been a “tough week” for him and his family.